J.P. Crawford entered Wednesday night hitting .139 this season at Triple-A Lehigh Valley, but his bat has shown signs of life in the last week. 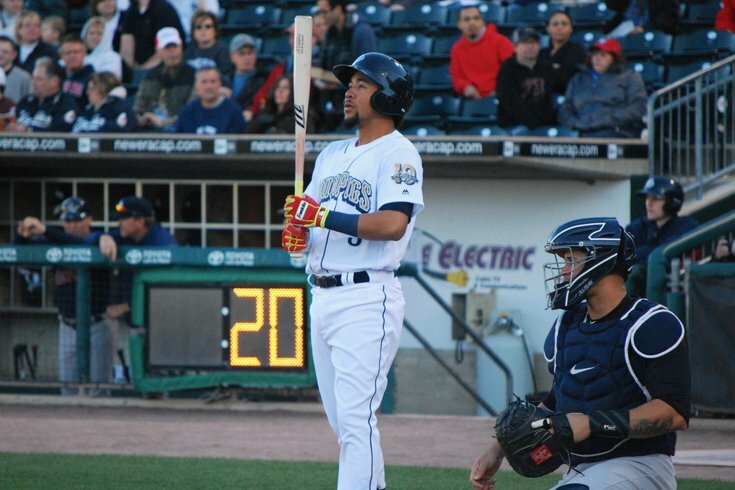 ALLENTOWN – J.P. Crawford’s modest five-game hit streak came to an end on Tuesday night at Coca-Cola Park, where the Lehigh Valley IronPigs outlasted the Gary Sanchez-led New York Yankees Triple-A affiliate in an 11-7 slugfest. The 22-year-old Crawford could probably care less about the hit streak, though, even when it came in the Pigs’ first game in May, following a dreadful first month for the top shortstop prospect. Crawford was content because his team won and he found a way to contribute, too. With the bases loaded in the second inning, Crawford collected his team-best 13th walk of the season to drive in a run and keep a rally alive. In the seventh, with runners on first and second and no one out, Crawford bunted both runners over. Both would score when the next two hitters followed with a single and a sacrifice fly. Other people would kill to have this job. So I’m going out there every day trying to get better, that’s all you can do. If it seems like Crawford has been on the cusp of a big league promotion for some time, it’s probably just because he’s held the status by most as the organization’s top prospect for nearly three years. (Important note: just because someone is at the top of any organization’s prospect list doesn’t mean they’re the closest to the big leagues). With that said, Crawford, No.2 in our latest Phillies Prospect Power Rankings, graduated to Triple-A before Memorial Day in 2016. He has been a phone call away from joining the Phillies for nearly a year. .224/.315/.292 with 12 doubles, two triples, four home runs, 55 walks and 81 strikeouts. A few weeks ago, we drew a fair comparison between Crawford and the minor league career of Jimmy Rollins. Click on that link, scroll down – it’s worth your time. It’s surely not the time to give up on Crawford as a legitimate offensive prospect. .269/.336/.449 with 29 doubles, 11 triples, 12 home runs, 50 walks and 56 strikeouts. And yet: it’s probably equally fair to let Crawford have those 70 extra plate appearances/28 games before we make any further comparisons or assumptions. Last week, Jordan and his staff identified Crawford among several players they wanted to send messages to with the season’s first month winding down. They wanted them to see the finish line of April approaching with the idea of building momentum heading into May. Crawford did just that: he went 6-for-20 (.300) with a double, three walks, three strikeouts and two stolen bases in the final five games of the Pigs’ recently completed road trip. And then he went hitless but had two productive plate appearances in the Pigs’ first game back home on Tuesday night. Ask Hickey: When will the Phillies be as good as the defending-champion Cubs? Want to find out if you were on TV during a Phillies game? Now you can. Still, the Triple-A numbers in the last calendar year are what they are and Crawford himself expects an awful lot more than he’s produced. “I didn’t start off the greatest, but I’ve just been fighting every day to try to get better and help my team win,” he said. While the everyday nature of baseball can often work to a player’s advantage, letting them continue to build on positive momentum or giving them the nightly opportunity to escape a slump, it could also work the other way, too. If a slump persists for weeks, then you’re battling the mental side of the game, too. Crawford hasn’t had that problem. And the possible, yearlong distraction of being one phone call away isn’t a factor, either. Wednesday presented another one of those days. In his first at-bat of his second game in May, the month he couldn’t wait to see on the calendar, Crawford tried to bunt for a base hit. RailRiders pitcher Daniel Camarena easily plucked the pop up out of the air to record the second out of the inning. He singled to right in his next at-bat. There will be plenty more at-bats for Crawford in 2017. He will have ample opportunity to polish up his status as top big league prospect.